Who murdered the Cheyenne State University student? 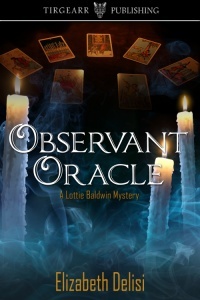 Can deputy sheriff Harlan Erikson solve the case quickly enough to keep his fiancée, impulsive psychic Lottie Baldwin, from snooping on her own? Harlan shook his head, but followed Lottie into the underbrush. Though he had no way to explain her psychic powers, he’d seen them verified time and again. When she got a feeling, he’d learned to pay attention. “Can I help?” Lottie’s small voice came from behind him. He turned to her. Her face was as white as a wedding gown. She shivered, then gave him what was no doubt intended as a reassuring smile, though the effect was ghastly. He nodded encouragement. She turned and was soon lost to sight in the heavy undergrowth. With a sigh, Harlan turned his attention back to the crime scene and the unfortunate victim.